A camping tour through the French countryside can take weeks as there are so many beautiful areas to visit. An ideal spot to visit is Camping Le Paradis, which is located in the Charente ,in the thick of the countryside. 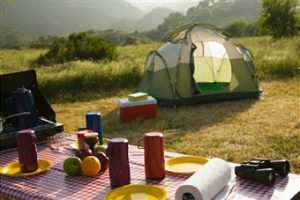 This campground is open all year long and provides tent, caravan, and motor home camping. There’s also room to store caravans and holiday homes are available to rent. Each hard standing site comes with electricity and a fresh water tap. Camping Le Paradis lies in a tranquil area where you can explore the local region by hiking and cycling. There’s also wonderful assortment of bird and wildlife in the region. If you’d like to spend your time on the campground just to get away from it all you’ll find a barbecue area along with a communal garden. There’s a play area for the children and a small store and library. If you’d like to work in the peaceful surroundings of Camping Le Paradis, internet connection is available. If you just happen to be driving through the area, you can always stop at the campground for a night or two as there are five mobile homes for rent. These all have patios and can accommodate between four and eight travelers. The area is filled with history and culture and it’s not far to some of the local towns and attractions such as La Rochelle, Limoges, Cognac, and Confolens. If you’d like to engage in some outdoor activities there are two large lakes where you can enjoy swimming, fishing, windsurfing, and canoeing. There’s also a golf course, adventure park, tennis courts, horseback riding, an aquatic centre, swimming pools, bike hire, shopping, restaurants, and zoos close by. Camping Le Paradis also provides disabled facilities, hot showers, toilets, laundry facilities, and a chemical disposal. Dogs are also welcome.